Please enter the name you want on the puzzle stool. Sometimes little kids need a boost, and our flip stool is perfect for the task. A classic piece of childhood furniture. The Flip Stool helps toddlers feel independent. This handsome stool is versatile, functioning as both a chair and a step stool. Measuring 19" x 14" x 8"H (back: 16"H), it's easy to clean and carry. Yes these are puzzles. The letters in the namesame come out like a puzzle. 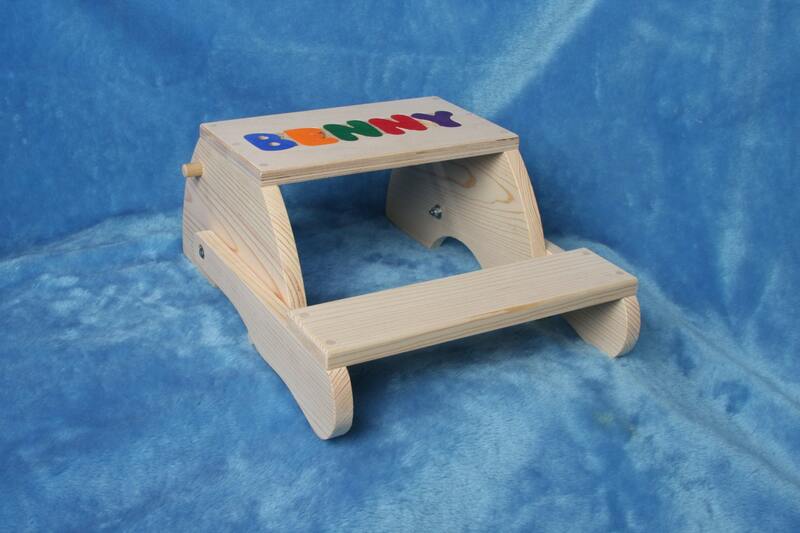 This folding stool can be made with 1 line name or 2 line name. Maximum letters per line is 7 letters. Please choose Primary or Pastel colors. I have been ordering these step stools for several years as baby gifts. I recently bought 6 and the turn around was quick; within 2 weeks. Everyone loves them and I always get pictures of the children sitting on them 1 or 2 years later. I will continue to buy these as long as they keep making them. The parents tell me that they have held up really well. I really like that I can usually put their whole name on the seat for no extra cost. I ordered 2 stool for my kids for Easter. They arrived much sooner than I planned. Great customer service and very responsive. Great quality, beautiful product. I am so excited for my littles to play with these.